Mineral Veil by Bare Escentuals is a natural powder that gives your makeup a finished airbrushed look, says B.E anyway. It is formulated with an SPF 25 for sun protection, which is one of the most important factors for me when choosing makeup. 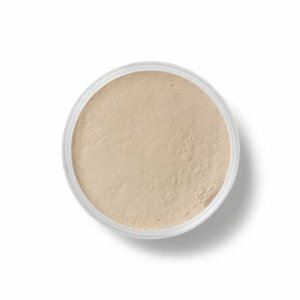 This powder also helps eliminate shine, therefor making skin appear mattified. It should help minimize fine lines and pores, while lasting all day long. There are 2 options for Mineral Veil, either the translucent powder or a lightly tinted shade for a bit of color. Both are suitable for all skin tones. Like other most other Bare Escentual products Mineral Veil doesn't contain Parabens- Sulfates- Synthetic Fragrances- Synthetic Dyes- Petro-Chemicals- Phthalates, so good for those of you that like to keep it natural. Zea Mays (Corn) Starch, Corn Starch Modified, Zinc Stearate, Silica, Magnesium Stearate. MAY CONTAIN: Titanium Dioxide, Iron Oxides. It was hard to find any bad comments about Mineral Veil, there was just one lady who said it makes her look pasty and pale. However, most other bareMinerals fanatics aspire to it, saying it gives flawless coverage, provides sun protection, is natural looking and lightweight. Patrons think it is reasonably priced at $19 a pop considering it does so much. This entry was posted on Sunday, September 19th, 2010 at 2:39 pm	and is filed under Bare Escentuals, Face Powders, Make Up, Reviews. You can follow any responses to this entry through the RSS 2.0 feed. You can leave a response, or trackback from your own site.